It was one of the 20th century's most defining moments. At 2.41am on May 7, 1945, the German Third Reich signed its unconditional surrender to the Allies. With a few flicks of the pen, World War II – a conflict that had ravaged Europe and spread its ruinous tentacles across the globe for more than five years – was (almost) consigned to history. The exact site of the Nazis' surrender is a question that has, down the years, puzzled many a pub quiz contestant. The answer lies in the most unexpected of places – which is how I find myself in a high school behind the railway station of Reims. 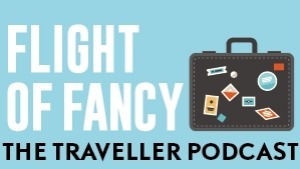 This charming French city – 129 kilometres north-east of Paris and pronounced "Ranz" – is more renowned for its bubbly, with champagne houses gracing the city and its neighbouring, vineyard-carpeted countryside. But Reims has a compelling and often-overlooked war history. You'll hear all about it on Collette's Memorials of World War II tour, a new nine-day adventure that's being launched in 2019 to mark the 75th anniversary of the D-Day landings. Visiting the war cemeteries and shrapnel-riddled beaches of Normandy will linger long in the memory, but Reims also stays with you, particularly its Musee de la Reddition – or the Museum of the Surrender. It's tucked down Rue de President Franklin Roosevelt, on the west (wrong) side of the train tracks splitting Reims' compact city centre from its outer suburbs. Four Allied flags – the British Union Jack, American Stars and Stripes, French Tricolour and Soviet Hammer and Sickle – flutter high on poles by this museum, which fills a corner of the vast red-brick Lycee Roosevelt, a centre of science and technology that was, in the latter stages of the war, the secret base of SHAEF (the Supreme Headquarters Allied Expeditionary Force in Europe) led by General Dwight D. Eisenhower. In the museum's snug ground-floor cinema, a 15-minute film, brimming with archive footage, helpfully puts everything into context. The Americans had pitched up in Reims the previous August. It was one of dozens of French towns and cities liberated from the Nazis in the weeks after the Normandy landings of June 1944. Situated at the heart of the battle-scarred Champagne-Ardenne region, Reims was regarded as a key strategic location for the Allies to continue their capture of German territory – just as the Soviet Red Army was squeezing the Nazis from the east, their sights trained on Third Reich capital, Berlin. The museum's upstairs rooms chart the French resistance and the crucial battles that sparked the Nazis' demise. Dozens of mannequins, most looking like chiselled super-models, sport an array of Allied army uniforms alongside weapons, wireless equipment, photographs and model ships and planes. Newspaper front pages, hailing the Allied triumph, catch the eye, and there's a copy of the surrender document penned by Nazi General Alfred Jodl. It came eight days after Adolf Hitler committed suicide in his Berlin bunker. The museum's most intriguing room is the Salle de la Capitulation – and there's a knot in my stomach as I enter, treading its slightly cracked, rusty-red-hued stone floor, nosing the vaguely musty scent and surveying high walls plastered in giant old maps detailing the battle lines, railways, airfields, casualty numbers, weather forecasts and other elements in the theatre of war. Behind a curved glass barrier – thus preventing visitors from carrying out any re-enactments – is a school classroom-style table skirted by wooden chairs labelled with the names of the majors, admirals and other delegates that attended the surrender. A black-and-white snap shows this fateful gathering, which agreed the war would end at 11.01pm the following day (May 8), thus giving German troops time to flee and avoid capture. Eisenhower wasn't at the signing, sending chief-of-staff, General Walter Bedell Smith, in his place, but he received General Jodl in private afterwards. Contrasting fortunes awaited them. Jodl was hung for war crimes at Nuremberg in 1946. Eisenhower would become US president in 1953. He was also made an honorary citizen of Reims. Exiting the museum, crossing a railway bridge and walking back towards the city centre, I ponder Reims' role in the war, which is widely forgotten outside France. You could say Joseph Stalin had a hand in that. Although the Soviets had a representative (General Ivan Susloparov) in Reims for the Nazi surrender, Stalin demanded a second surrender and he got it, on May 9, to much fanfare and media coverage in Berlin, a city in hauntingly-evocative ruins after the Red Army's assault. To this day, May 8 is known as VE (Victory in Europe) Day in Western Europe; in Russia, Victory Day is May 9. The war ended for good three months later with the Japanese surrender following the levelling of Hiroshima and Nagasaki. For a city that was itself almost destroyed in both world wars, Reims shapes up pretty well these days, with a peaceful, leisurely-paced vibe and abundant pedestrian-friendly boulevards, cobbled lanes and squares lined with striking architecture, from reconstructed medieval and neoclassical buildings to flamboyant interwar art deco jewels and imposing war memorials. At the hub of it all is a magnificent Gothic cathedral. Another Notre-Dame, it was heavily shelled in World War I, but pieced back together with panache. Beyond its awe-inspiring twin-towered facade, clad with hundreds of saintly statues, there's a vast interior with sublime stained-glass windows, including three, designed in contemporary style, by Marc Chagall. 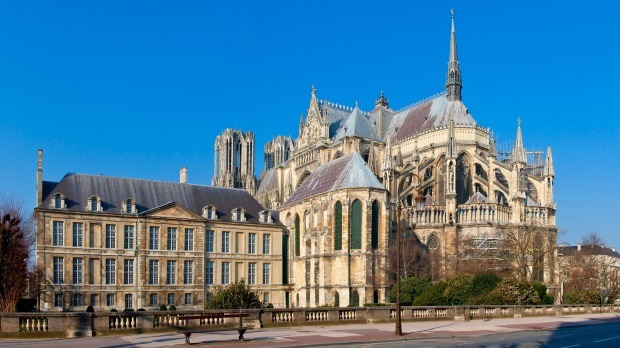 You're walking in the footsteps of kings in Reims cathedral; 33 French monarchs were crowned on these sacred grounds, including Charles VII, scourge of the English during the Hundred Years' War. Among those to kneel before him was Joan of Arc, and a statue of the French heroine stands outside the cathedral. Next door you can potter around the Palace of Tau, the former Archbishops' palace where coronation banquets were staged (the last one being that of Charles X in 1825). Local wine was imbibed during these royal feasts, but most kings never toasted their reign with bubbles. Disputes abound as to champagne's inventor, but it's widely believed this sparkling wine was first created near the end of the 17th century. It's hard to avoid champagne in Reims today. Bottles, both regular-sized and gigantic, fill shopfronts, bar shelves and ice buckets, and locals and tourists sip litres of the stuff on Reims' pavement terraces. Chefs aren't shy to use champagne in their recipes either. At the snazzy Continental Restaurant, overlooking the people watchers' haven that is Place Drouet d'Erlon, I enjoy a delicious four-course meal that includes succulent chicken breast – and crispy celery chips – bathed in a rich, tangy champagne sauce. It's possible to book guided tours and tastings at Reims' champagne houses and estates, with many welcoming you into the cavernous underground chalk cellars that date back to Roman times and provided shelter for soldiers and civilians during the world wars. Two famous producers, Taittinger and Veuve-Clicquot, are about two kilometres south-east of the centre, and on the your way there, you could stop off at the abbey and basilica of Saint-Remi. A UNESCO World Heritage site, together with the cathedral and Palace of Tau, it holds the tomb of the eponymous bishop who converted King Clovis to Christianity in Reims in the late 5th century. Clovis had united the various warring Frankish tribes and is considered by many French people as the founder of their beautiful and endlessly-entrancing country. Navigate the labyrinth of corridors hidden under the streets of London's Westminster and you'll see where Winston Churchill and his war cabinet plotted for victory. After riding the Eurostar under the Channel, immerse yourself in the events of June 6, 1944, when the largest amphibious invasion in history hit Normandy. Omaha, Utah, Sword and Juno beaches are all on the itinerary, as is Pegasus Bridge, a vital structure across the Caen Canal captured by Britain's airborne division prior to the invasion. 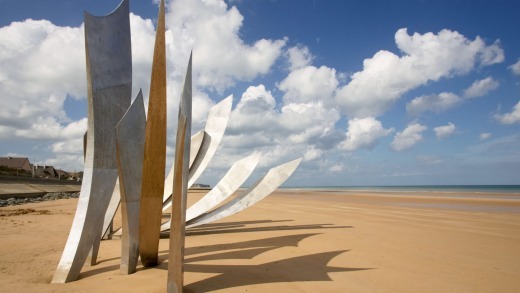 Delve into the details of the D-Day landings and Europe's post-war transition at Caen's Peace Museum, and pay your respects at the Bayeux Cemetery and Memorial – the largest WWII cemetery of Commonwealth soldiers in France. Another French city with a turbulent history, Compiegne witnessed the Armistice signing that ended World War I. Set in a former military barracks, the city's Memorial of Internment and Deportation is dedicated to the 40,000 people deported to German camps during WWII. Learn what life was like in Nazi-occupied Paris on an expert-led walk through the French capital, before a farewell dinner inside that most famous of landmarks – the Eiffel Tower.